This specialist assessment CPD training course covers current best practice in report writing and preparation for those looking to gain or renew an Assessment Practising Certificate (APC). There will be a focus on assessments for post 16 year olds and meeting the Report Writing requirements for Disabled Student Allowances (DSAs), however this is also applicable for those working with wider age ranges and needing to update professional practice. Our trainers are experienced, qualified specialists in diagnostic assessment report writing and assessment testing for dyslexia/Spld working to the SpLD Assessment Standards Committee (SASC) criteria. 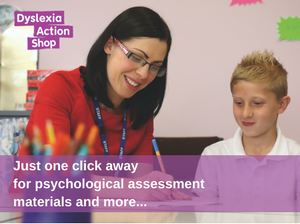 Dyslexia Action Training is a SASC Authorised CPD Provider. This course is suitable for those seeking to gain or renew their Assessment Practicing Certificate (APC). Twelve learning hours, of which five hours of the total learning hours for this course are recognised and accredited by SASC as fulfilling, in part, the (minimum) 20 CPD hours required over three years that contribute towards gaining or renewing an APC. 12 hours of online learning (five of which are SASC accredited), conducted over a 4 week period. Tutor support throughout the duration of the course. Please note this course does not actually give you an Assessment Practising Certificate (APC). For further details on gaining your APC please click here. equivalent, and be familiar with diagnostic assessment report writing. £205 +VAT for Non-Guild Members paying online by debit/credit card at time of registration. £195 +VAT for Guild Members paying online by debit/credit card at time of registration.